The Best Long Range Target Camera System money can buy! 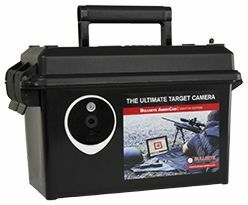 The Bullseye Camera AmmoCam Long Range Edition is a camera that sits downrange by the target and wirelessly transmits shots back to your Laptop Computer or Mobile Device to your shooting location up to 1 Mile away. You will see each shot flashing on the screen no matter how many times you have shot the target. Basic Instructional Video. Setting up, turning on and using the software. The system works for rifle, pistol, archery, small bore, large bore and patterning shotguns. No more taping bullet holes or changing targets every few shots. This is the perfect alternative to those expensive long range spotting scopes ! The Bullseye AmmoCam Long Range Edition is really easy to use and great fun for one person, or more, to enjoy long distance shooting without the need for conventional spotting scopes. Whether you are sighting in your rifle for hunting, target or competition, this system is for you. Multiple users can shoot and view the same target. Great for training.